A leisure centre was evacuated in St Andrews in Scotland last August following a chemical spill. 19 people were taken to hospital following the spill. The casualties were brought to hospital due to breathing difficulties. Three fire engines and 15 ambulance service vehicles were called to East Sands leisure centre in St Andrews, Fife. The Guardian reported that “Victims said they had seen clouds of gas and smelt a strong odour that made them cough and their eyes sting. The leak was reported to be sodium hypochlorite, a chemical compound used to make bleach, though witnesses said they believed it to be chlorine.” Both chemicals pose a very real risk to human health with inhalation of enough quantities being linked with serious respiratory problems. Almost a year has passed since this incident and the HSE have completed an investigation on the incident and have recently ordered for a number of safety improvements to be made. The incident at East Sands Leisure Centre in St Andrews left five children and 14 adults suffering breathing problems and requiring immediate medical treatment on August of last year. The HSE investigation has also highlighted several breaches of health and safety law, although thankfully steps of mitigation have now been taken to reduce the risk of such an incident happening again. Investigators from the HSE initially stated that the incident involved the uncontrolled release of the chemical sodium hypochlorite from the pool’s storage tank, but after further investigations the HSE have discovered more about how exactly this leak happened. According to the HSE report the design of the tank was “unsuitable” because it did not have “sufficient strength” for the loads which were applied to it. The HSE report also stated how the support structure for the tank was not suitable and as a result lead to a “more rapid failure.” The Courier reads that the HSE report described how “White crystalline deposits below the tank indicate that the tank was likely to have leaked for a long time prior to failure and this could have been identified during routine examination.” One other issue that was brought up by the HSE was that the bund which was surrounding the tank was in poor condition and was not capable of holding large quantities of chemicals. Equipped with a secondary containment system or bunding which is resistant and certified to hold highly corrosive liquids. 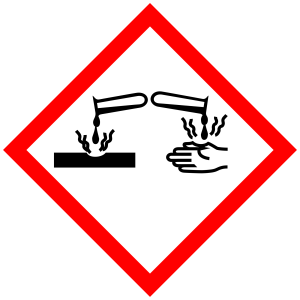 Safety signage must be positioned on cabinets, containers and tanks highlighting the hazards each chemicals poses. For any advice you have regarding hazardous materials in the workplace don’t hesitate to contact one of our experts today.